HOUSTON — Their faces are filled with excitement. In orderly lines, thousands of elementary school students enter one of the largest halls at George R. Brown Convention Center in Houston, Texas. Christmas music plays in the background as several groups perform on stage. Some of the children are laughing. Some stare wide-eyed at the thousands of Christmas presents neatly organized in clusters all around the place. For many, this will be the only Christmas gift they will receive. “You will see children who will not open their toys. When asked why, you find out that they have nothing to open on Christmas day,” said Israel Gomez, founder of “Navidad en el Barrio” a one-day event that distributes toys, books and joy to more than 2,000 children every year. This year, the much-anticipated celebration took place on Saturday, Dec. 12. 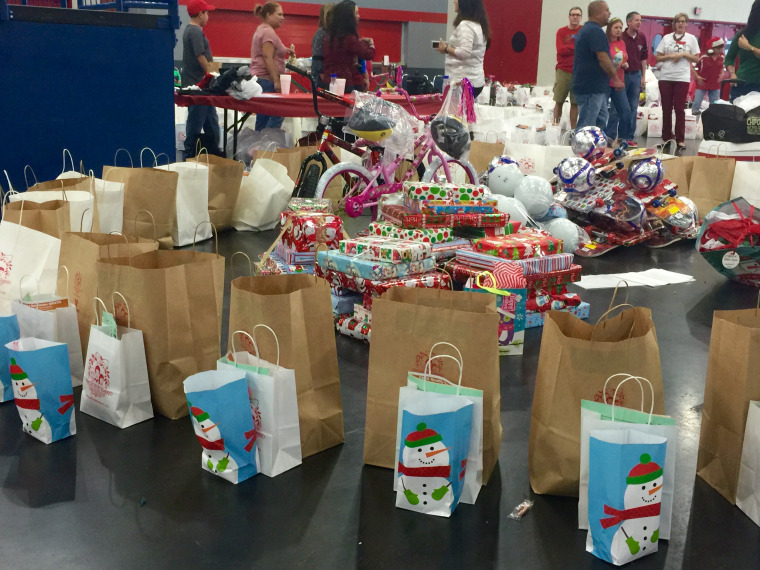 Gomez has been widely praised for creating what has become an important part of the Houston community's holiday tradition, one that spreads cheer as well as life lessons for the many children who have participated in the event. Thirty years later, Gomez continues raising his hand. He leads the non-profit organization that coordinates the efforts of hundreds of volunteers or as he, calls them “angels.” But most importantly, he fosters the relationships with the corporate sponsors that make the event possible. One integral part of the celebration involves teaching the children that “giving” goes both ways. “I do not want the children to come in through one door, get a toy and out the other door,” Israel says. This is the reason each child is asked to bring one can of food. The cans are deposited in a container. At the end of the event, once the cans are gathered in one huge pile, the children realize that their contribution makes a difference. The cans are then donated to the Houston Food Bank. Another important component in the festivities is Richard Reyes. After watching the film “Zoot Suit” starring Edward James Olmos in 1981, Reyes came up with a Latino version of Santa Claus. He baptized himself “Pancho Claus” and since then he has been performing at different events, primarily at “Navidad en el Barrio,” dressed in a red bright suit similar to the ones worn in the 1940s. Reyes does not pretend to be Santa Claus. “Actually, I say he is my ‘primo’ [cousin]. We call him ‘El Güero’ and we just help him in the barrio because he is a real busy guy,” said Reyes, who has been one of the lead performers at the event since its early years. With a group of dancers, Pancho Claus sings, dances and sends positive messages to the children. “I just want to do something with my cultura. I believe the children have fun with my character because it is so totally different from the traditional Santa Claus. Children perceive it differently. I believe he teaches them not to judge a book by its cover, respect the elders and enjoy the true meaning of Christmas, which is family, the love around you - not the biggest present,” Reyes said. The event doesn’t just build strong relations with the man in red, it also builds relationships between the children and the men and women in blue. Gomez knows that some of the children haven’t lived in ideal circumstances and perhaps they have witnessed a close relative being taken away in handcuffs. He feels that the event he started decades ago is doing its part to change that perception. Apart from the lessons they are learning, the children are mainly excited to pick up a gift and enjoy the magic of Christmas. Because even if Santa Claus doesn’t make it to their house on December 25, his elves and “primo” have done everything they can to make it a merry Christmas. And it all started with a friendly Latino police officer raising his hand to volunteer.